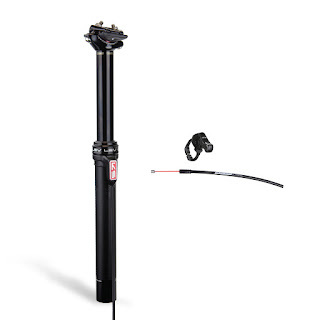 All Things Bike: You need a dropper post. You need a dropper post. I can't ride without a dropper post anymore. I would honestly give up suspension over my dropper on any trail. I'm not saying I would like to give up suspension, but if I were tight on money, I would gladly go hardtail or rigid rather than forego the dropper. And the lower I can get my seat, the better. My reasoning is I move around a lot while cornering and descending. I stay pretty well upright but my bike moves around a lot, pitching forward and laying over far more than my body does. I also drop my saddle a little when I'm trying to start moving on loose or technical climbs. It helps me get traction so I can ride instead of pushing my bike up if I have to stop for some reason(like my lungs are on fire). 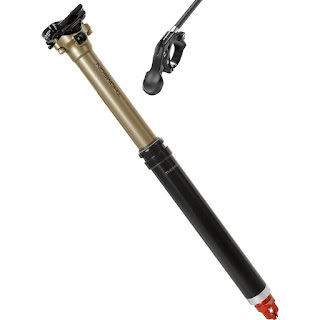 You may have heard some horror stories about a dropper post blowing up on an epic trip. I've heard similar stories of hubs and derailleurs blowing up also. 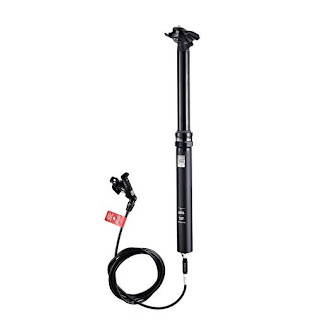 But some people look at a dropper as unnecessary, so they remember the story about a dropper that ruined a trip rather than an emergency bike shop trip for a freehub body that gave up. Dropper posts need to be serviced just like suspension, drivetrains, or bearing units. It's true that it adds something else that needs to be serviced. But it helps you to enjoy the ride, and if we were all incredible riders that wanted to avoid servicing our bikes, we would ride singlespeed 26" bikes and have very few problems ever. Now that we've established that you need a dropper, which one should you get? Honestly, it doesn't matter. They all have their quirks and advantages. If you have external routing for cables I recommend the KS LEV. The cable is stationary so it doesn't move regardless of whether the saddle is up or down. If you have the option, always go for stealth, or internal, routing. If your frame can accept it, Thomson's Elite Covert or RockShox Reverb Stealth are my favorites. The Thomson feels more solid in the post itself, but I personally prefer the hydraulic actuation and remote of the Reverb. I've ridden both and both have comparable reliability in my experience. You need to make sure that whichever post you go with, you store your bike with the post extended. When it's down, it puts extra pressure on the seals and will cause them to fail prematurely. You also need to top off air pressure once a season on most posts. I have found that when the post is quicker to respond, I use it more. I had a KS eTen on my fat bike a few years back because it was cheap and I didn't think it would matter much. But it was so slow to return to full extension that I only used it when I really felt I needed it. I ended up replacing it with a KS LEV. If you're still not sure you would use it much, or if you have one that you only use occasionally, ride The Whole Enchilada in Moab. You'll see the benefit and start using it a lot more.